Manufacturers, supplier, and exporter of outstanding variety of cable trays, raceways draw boxes and industrial fabrications. Cable trays are made out of M.S. Steel, Stainless Steel and Aluminum. 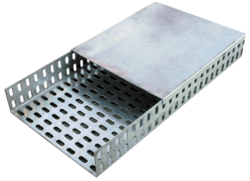 We supplies perforated cable trays, ladder type cable trays, wire ways/raceways, basket trays, junction boxes, fire boxes, raceways draw boxes & industrial fabrications, and their accessories such as bends, elbows, tees, cross, reducers, and many more. Exporter for Mombasa, Kenya, Uganda, Tanzania, Zambia, Zimbabwe, Botswana, South Africa, Namibia, Angola, DR Congo, Sudan, Nigeria, Ghana, Libya, Egypt, Saudi Arabia, UAE, Burundi, Rwanda, Djibouti, Ethiopia, Dar es Salaam, Johannesburg, Durban, Pietermaritzburg, Dubai, Doha, Qatar, Bahrain, Sharjah, United Arab Emirates, Oman, Mauritius, Malaysia, Myanmar, Burma, Philippines, Vietnam, Nepal, Sri Lanka, Bangladesh, Azerbaijan, Albania. Cable Trays are easy to install & instant approach for repairs & Replacement.